Fuels and oils are composed mostly from hydrocarbons, both linear chain and branched isomers. In GC and GC-MS analysis of various fuels the aliphatic linear chain hydrocarbons are shown as peaks, while the various branched isomers usually constitute the known unresolved hump together with a multitude of minor peaks that require appropriate mass spectrometry for their proper analysis. Isomer distributions affect all the major physical and chemical properties of oils and fuels including: combustion and octane number, flash point, viscosity, lubrication properties, solubility and solvation power, boiling points and melting points. However, since current instrumentation can not be used for isomer distribution analysis this important subject is being ignored. In this note we try to explain why GC-MS with standard EI fails to properly analyse hydrocarbon isomer distributions and demonstrate that the 5975-SMB GC-MS with Cold EI can provide this, otherwise missing, vital information. In GC-MS analysis the GC separate hydrocarbons according to their boiling points. Thus, since hydrocarbon branching lowers the compound boiling points, GC separation provides a convenient method for the separation of hydrocarbon isomers and the greater the degree of isomer branching the earlier is the elution temperature and time. In addition, while the number of possible isomers grows in a combinatorial fashion with the number of carbon atoms, only a limited range of hydrocarbon isomers are actually produced via natural synthetic roots and as a result isomer distribution are often highly structured, informative and characteristic to the fuel source and method of processing. However, despite the above, GC-MS with standard EI fails to analyze hydrocarbon isomer distributions. The molecular ions of hydrocarbons are weak and their relative abundances fall exponentially with the number of carbon atoms as shown in our previous note. In addition, the molecular ion is further reduced in branched isomers and this reduction can be by an additional one order of magnitude. Consequently, the intensity of reconstructed (extracted) molecular ions (RSIM) mass chromatograms is weak and noisy and often with insufficient intensity. The relative abundance of the molecular ions is strongly dependent on the isomer branching and carbon number (size) and thus isomer distributions via the molecular ions does not provide appropriate quantitative information on the relative abundance of isomers. In view of the complexity of fuels and oils compositions and the weakness of the molecular ions and high mass fragments in standard EI mass spectra, isomer structural mass spectral information is obscured and cannot be properly exposed and used. While the molecular ions are weak and the mass spectra are dominated by low mass fragments, high mass fragments are also often more abundant than the weak molecular ions. Thus, high mass spectral fragments of branched isomers of bigger hydrocarbons have fragments with M-15, M-29 and M-43 and these fragments have C13 isotopomers with M-14, M-28 and M-42 that have the same mass as smaller size hydrocarbons. As a result, the mass chromatograms of a given hydrocarbon with standard EI are contaminated by interference from other hydrocarbons and cannot be trusted to provide accurate isomer distributions. 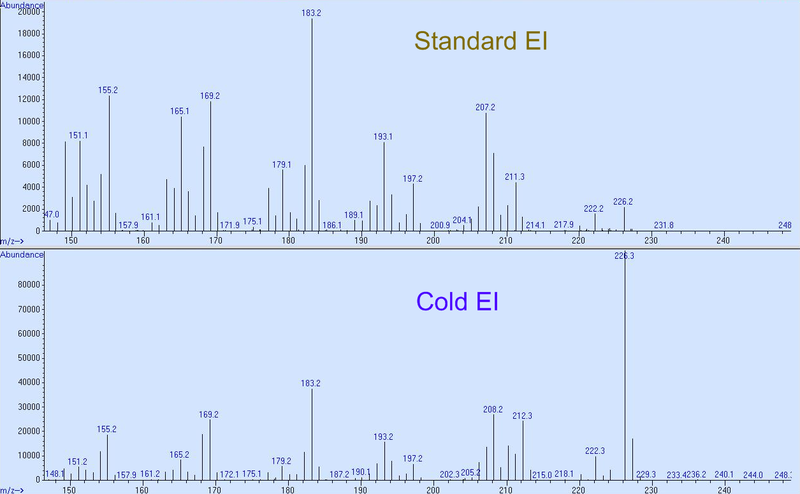 In Figure 1 the standard EI (upper trace) and Cold EI (bottom trace) mass spectra of n-C16H34 are shown in the range of m/z=150-250. 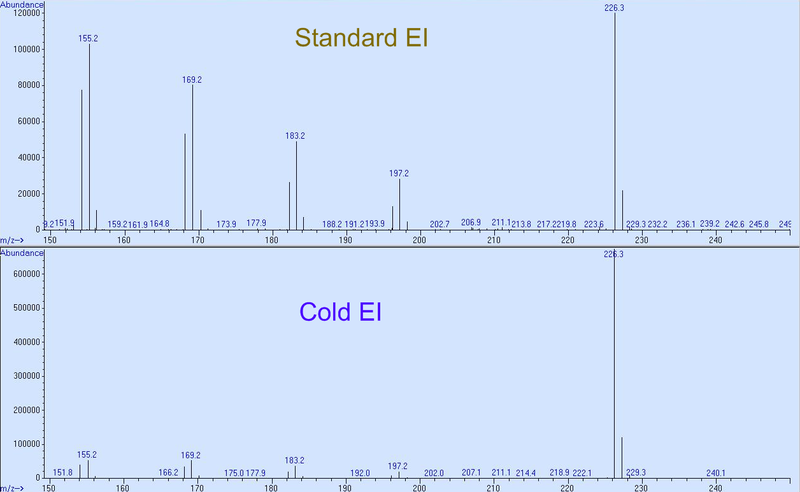 As shown, the standard EI MS is characterized by several fragment mass peaks that are "comparable" in their abundance to the molecular ion. In contrast, these mass peaks are much weaker in Cold EI. Figure 1. 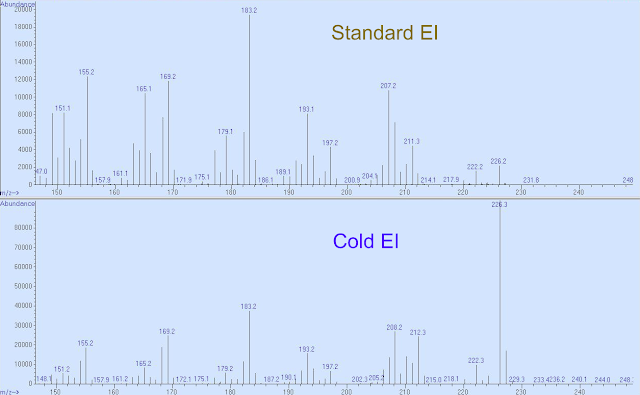 Standard EI (upper) and Cold EI (bottom) mass spectra of n-C16H34 in the m/z=150-250 mass spectral range. In Figure 3 below we show reconstructed mass chromatograms of the aliphatic C16H34 hydrocarbon in its fuel like complex mixture that was given to us by one of the major petroleum companies. The upper RSIM mass chromatogram was obtained with cold EI and the bottom RSIM mass chromatogram was obtained with standard EI. In both cases 1µg sample was injected on-column. 60 m column with 0.25 mm ID and 1.2 ml/min Helium column flow rate were used for Cold EI while similar conditions were employed with standard EI along with a slower temperature program rate. Both mass chromatograms are normalized to the intensity of the isoprenoid C16H34 hydrocarbon. The intensity of the molecular ion in standard EI is too weak hence its mass chromatogram has poor quality and insufficient signal to noise ratio for any quantification. In contrast, the Cold EI ion statistics is at least two orders of magnitude better than that of standard EI. 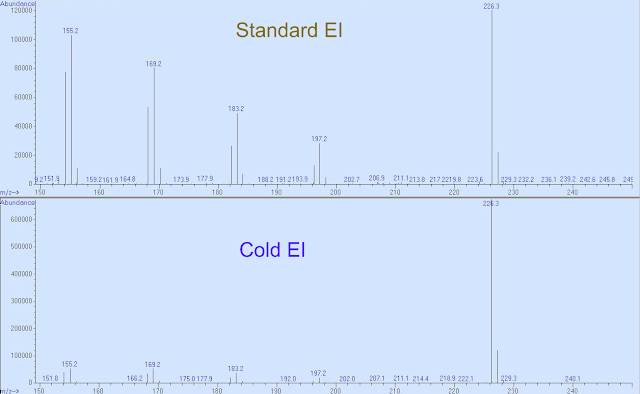 Note that the TIC numbers should be ignored as these experiments were performed using two different systems with x12 higher gain in standard EI relative to Cold-EI. The mass chromatogram of standard EI is highly contaminated by other non C16H34 hydrocarbons that elute after the peak of linear chain n-C16H34. This later elution implies that the isomer distribution in the appropriate elution time window could be contaminated by isomers of other bigger hydrocarbons. 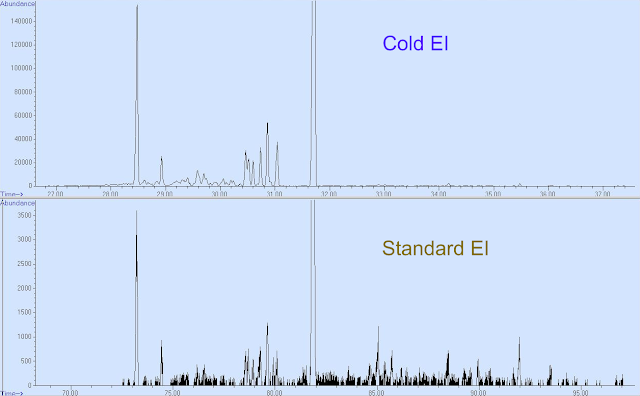 While not shown in Figure 3, the ratio of the mass chromatogram peak of n-C16H34/iso-C16H34 was bigger in standard EI by a factor of almost four than in Cold EI, as a result of the highly non uniform relative abundance of the molecular ions in standard EI. We started with a question "Hydrocarbon Isomers - Why Aren't They Analyzed" and the simple answer is that they are not analyzed since there is no instrumentation for the appropriate analysis of isomer distributions. Sadly, in chemical analysis what cannot be analyzed is ignored and in the hydrocarbon world the big petrochemical companies spend millions of Dollars on the use of FTICR for the analysis of trace polar impurities while the majority hydrocarbon isomers are neglected and ignored. The Aviv Analytical 5975-SMB GC-MS with Cold EI provides enhanced molecular ions for all hydrocarbons and particularly for highly branched hydrocarbon isomers. In addition, in Cold EI mass spectra the molecular ion is significantly enhanced compared with other high mass fragments. Thus, Cold EI uniquely enables isomer distributions analysis. Furthermore, extended range of compounds are amenable for analysis with short columns and high column flow rates, including low volatility large oil and wax compounds that cannot be analyzed by standard GC-MS. We explored isomer distribution analysis in a broad range of hydrocarbon matrices including gasoline, kerosene, jet fuel. Diesel fuel and various oils and waxes and relevant application notes are available on request.